For every clinical trial conducted in accordance with the German Medicines Act (AMG) or the Medical Devices Act (MPG), a sponsor within the meaning of §4 Para. 24 AMG or §3 Para. 23 MPG must be named. This sponsor bears overall responsibility for the clinical trial. The overall responsibility of the sponsor includes, in particular, securing the financing, initiating and organizing the clinical trial as well as monitoring and quality control. Some funding organisations (BMBF/DLR, DFG) demand the appointment of a sponsor and the obligation to adhere to the principles laid down in the Guideline on Good Clinical Practice (ICH-GCP-Guideline) even for studies that are not subject to the AMG or MPG. 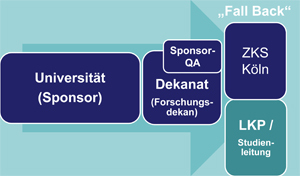 In the case of clinical trials initiated and led by members of the University of Cologne (Investigator Initiated Trials; IITs), the University of Cologne assumes the function of sponsor for all the above cases if no third party is a sponsor. The Rector of the University of Cologne has entrusted the Dean's Office of the Faculty of Medicine with the quality-assured performance of these sponsorship duties. The executive body is the Quality Assurance Unit (Sponsor-QA/QAU) under the supervision of the Dean of Research. The Dean of Research may delegate the performance of the sponsor duties assigned to him to the investigator responsible for the study (Head of the Clinical Trial (LKP/Studienleiter/in), who becomes the sponsor representative in this respect, or to the CCTC as the executing institution (case back). Qualified third parties may also be involved in the performance of sponsor tasks. The person carrying out the monitoring (quality control of the clinical trial) must not be directly subordinate to the LKP/study director. The assumption of the sponsor tasks is regulated internally in the "Uni-LKP" agreement (LKP = principle invesstigator). With the conclusion of the agreement, the principle investigator receives the power of attorney to represent the University of Cologne as a sponsor in external relations. For contracts, the principle investigator receives the power to negotiate but no power of attorney to conclude. Contracts are concluded by the university, represented by the DFS Administration of the University Hospital of Cologne and by the co-signature of the Dean's Office of the Faculty of Medicine (Dean of Research). The DFS Administration and the Quality Assurance Unit will carry out a preliminary examination.